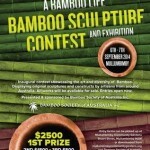 The weekend of 6-7 September, 2014, saw the Bamboo Society of Australia (BSA) put on its first Bamboo Sculpture competition. The competition was held in conjunction with the Living Community Festival at the Mullumbimby Community Gardens (7 Sept.). The weekend was, in a nutshell, fantastic. The comp attracted a dozen entries, each one distinctive, and diverse, in its own way. The judges must have struggled. First prize and the People’s Choice Award went to the two entries by the same creators. There are lots of images of the weekend on the BSA Facebook page. The event was made more fascinating for me because I was on site for the two days leading up to the exhibition. Most of the entries were so large that they were (re)constructed on site. 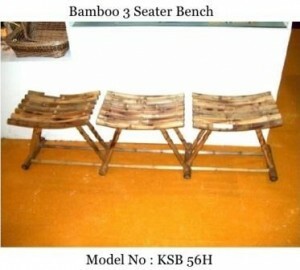 Just by hanging about and lending a hand here and there, I picked up some useful tips on working with bamboo. 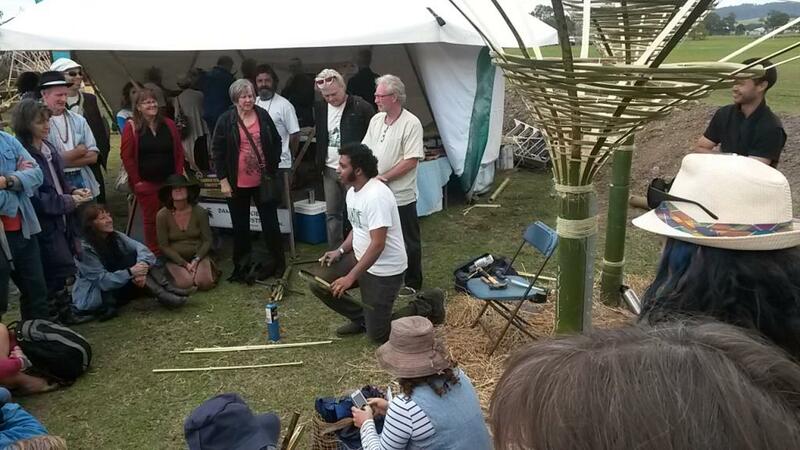 On the Sunday there were also impromptu demonstrations around the BSA bamboo yurt. Pictured above is Munir from Giant Grass. Munir travelled from Melbourne to create the sculpture behind him. Here, he is showing a fascinated crowd how to bend bamboo using heat, one of the processes he used to make the sculpture of bamboo funnels. Also present was Victor Cusack. Victor is well-known in Australia as probably our most prolific writer on Bamboo. 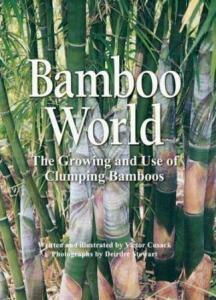 He was on hand to promote the beautiful new edition of his book, Bamboo World. You may find it on eBay au . It was something of a revelation for me to meet a group of people who are so passionate about bamboo and so generous with their knowledge. Really, all they talked about, with very few exceptions, was bamboo, in its innumerable manifestations – growing, collecting, constructing with, creating with… Future events are planned. Keep an eye on the BSA website. 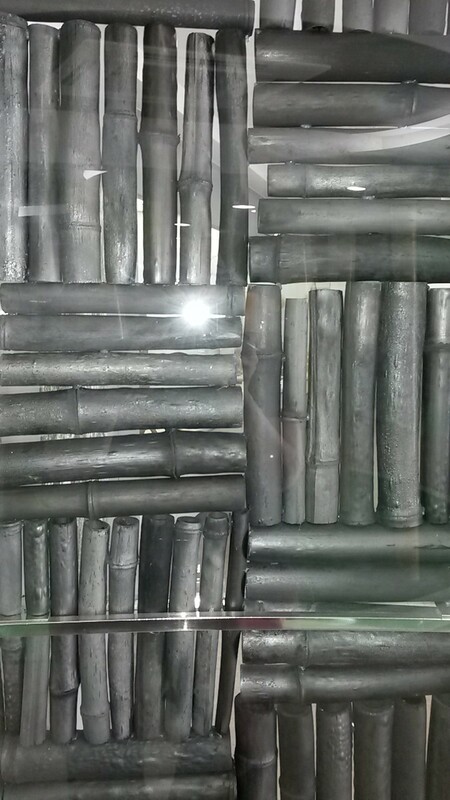 This entry was posted in All, Bamboo around the world, Bamboo craft and tools and tagged art, art installation, bamboo, bamboo festival, books, Mullumbimby, sculpture on 14/09/2014 by Deb. Guadua Bamboo, rich source of practical information about bamboo, recently featured an architect-designed tree house in Columbia. 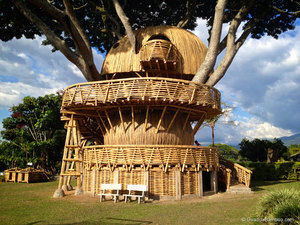 The tree house started life as an idea for a small bamboo house for the grandkids, but Guadua Bamboo architect Jaime Peña suggested a tree house. He designed this stunning tree house drawing on principles of biomimetic architecture. Biomimicry, examines nature, its models, systems, and processes for the purpose of gaining inspiration to solve human problems. Biomimetic architecture doesn’t replicate natural forms, but rather seeks to understand the rules governing those forms. And now, this highly desirable tree house in Columbia. 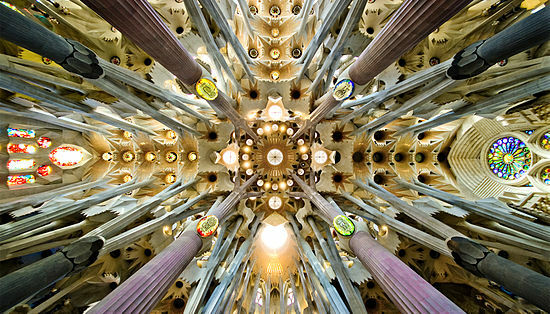 Biomimicry is not limited to architecture. 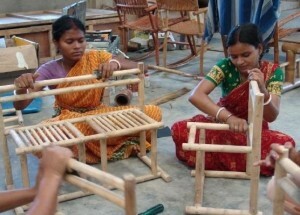 For some fascinating examples of biomimicry in agriculture, medicine, natural cleaning and more, see Biomimcry.net. 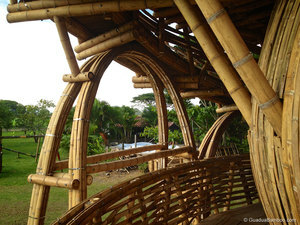 I highly recommend viewing the images of the tree house on Guadua Bamboo. (Click on a small image to start the slide show). Breathtaking and inspirational. 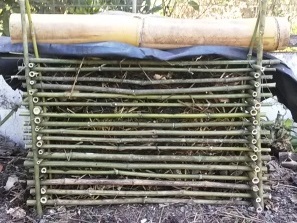 This entry was posted in All, Bamboo around the world, Bamboo craft and tools, Bamboo on the Internet, Building and Home Renovation and tagged architecture, bamboo, Columbia on 09/09/2014 by Deb. On a recent trip to Japan I purchased a few more tools for working bamboo. Visiting yet another large home improvement store on the outskirts of Tokyo, the Star-M triple cutter was spotted. Not by me though: one of my kind and generous Tokyo hosts drew my attention to it. (Thanks Koh). I was too focused on locating more spurred drill bits to even notice the picture of a clean hole in bamboo on the packet. 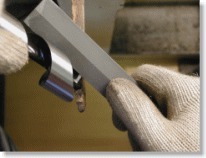 With a little online research it was identified, in English, as the Star-M triple cutter. It is listed in the special use category of the Star-M catalogue. 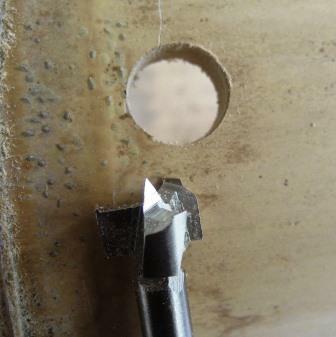 The drill bit is made in the style of a Forstner bit rather than the more common auger bit. As a Forstner bit, the triple cutter requires more pressure than an auger bit, so it’s better suited to a drill press than a portable drill. In the absence of a drill press, I did, however, manage to drill a very neat, clean 10 mm hole in a section of dry bamboo using my portable drill without too much trouble. The small diameter probably helped here. And a measure of patience. I had to stop from time to time to clear the shavings from the hole that started to smoulder slightly. Overall though, I’m very pleased with the end result. Amazon have a selection of Forstner bits. Although I couldn’t see any from Star-M, there are some with similar tips to the triple cutter. The situation is similar on eBay au . If you have your own drill press you probably already have a selection of Forstner bits. 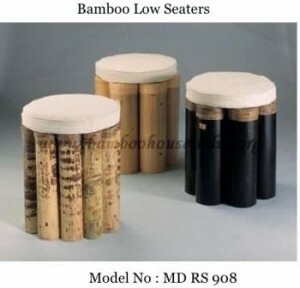 Do you have recommendations on the best Forstner bits for bamboo? Please leave a comment. 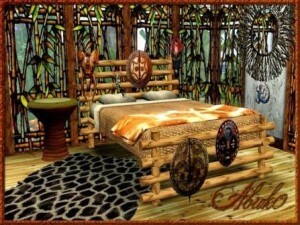 This entry was posted in All, Bamboo craft and tools, Bamboo product reviews and tagged bamboo, drill bits, drilling, Japan, Star-M, tools on 24/08/2014 by Deb. 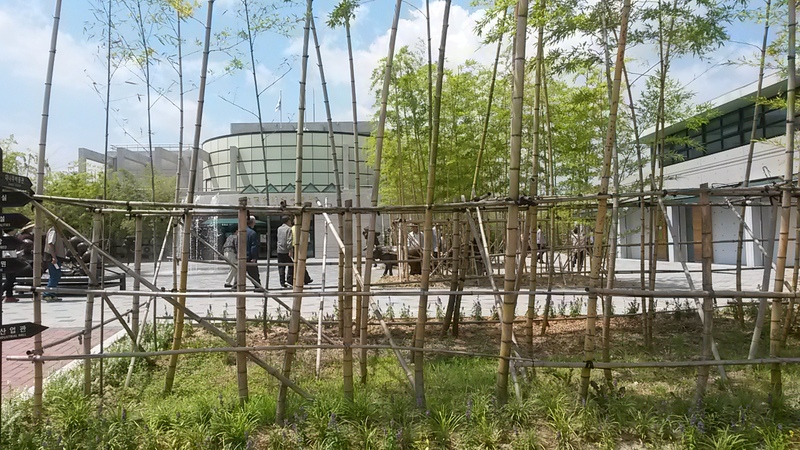 The bamboo museum at Damyang is quite a treat for anyone with more than a passing interest in the uses of bamboo. 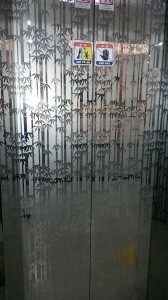 One room is dedicated to an exhibit about how bamboo grows, but the museum concentrates on displays that cover every imaginable use of bamboo, and then some. 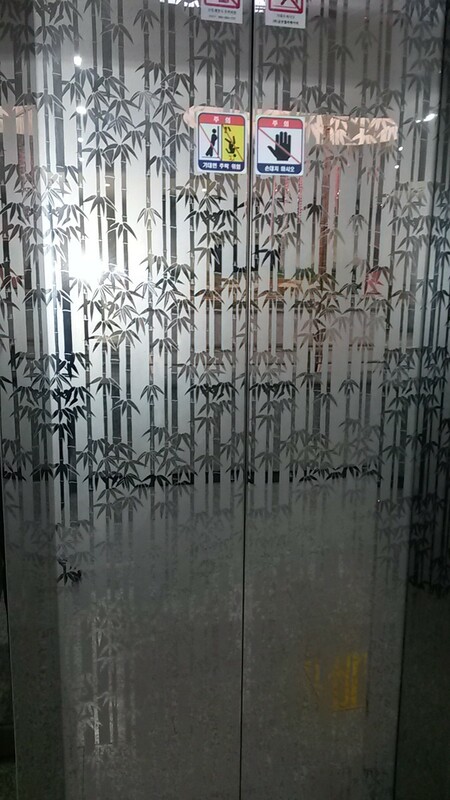 Even the lift doors have a bamboo motif. Many of the displays, unfortunately for me, remain a mystery, as the museum provides very little interpretation in English. Given the number of other native English speakers I saw during my visit (none), this is hardly surprising. 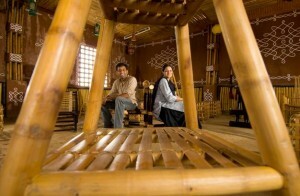 One whole room is devoted to photos, graphics, and written information about the production and benefits of bamboo salt. But that’s all I can tell you about it really, as only Korean is used for interpretation. I’m sure it’s fascinating. There are several souvenir shops attached to the museum. 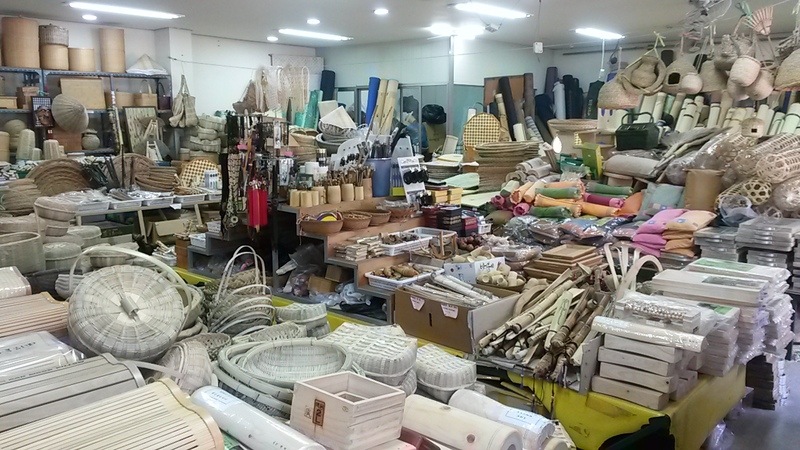 Each one offers a slightly different range of bamboo products. 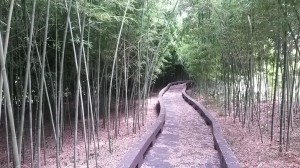 They all smell wonderful – like freshly dried bamboo, a grassy, woody, friendly, comforting kind of scent. 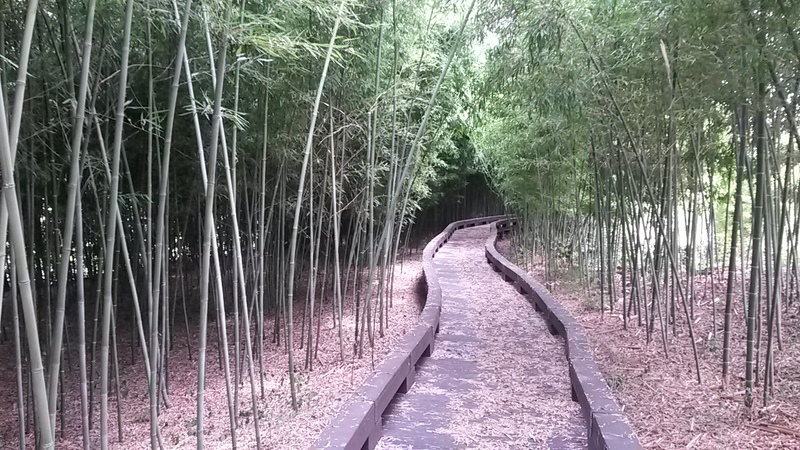 The bamboo museum sits among gardens, nurseries, sculptures, and, of course, its own little bamboo forest. I’ve got stacks more photos of displays within the museum, but inserting photos into the blog using a 7 in. tablet is testing my patience unnecessarily. I am on holiday, after all. 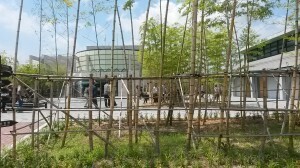 The bamboo museum in Damyang is short walk from the bus station and a very long walk from the bamboo forest. From Gwangju, a good base to visit Damyang, take local bus 311 from outside the Gwangju bus terminal. 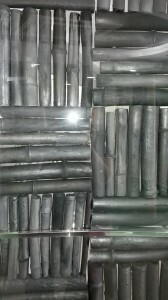 Where else might you see a bamboo charcoal dividing wall? 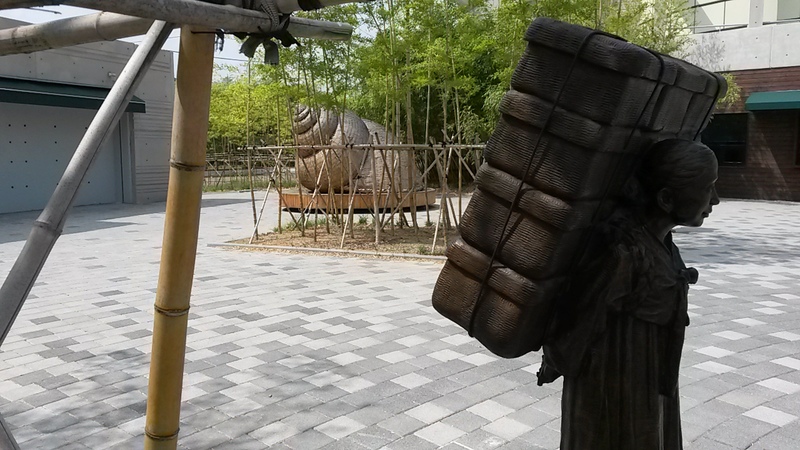 This entry was posted in All, Bamboo around the world, Bamboo craft and tools and tagged bamboo, bamboo festival, bamboo forest, bamboo museum, bamboo salt, Damyang, Korea on 10/07/2014 by Deb. 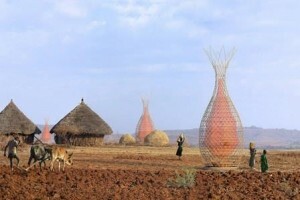 Made with a bamboo frame, WakkaWater is a proposed solution for water shortages in Ethiopia. These giant ‘bamboo vases’ are easily constructed with local materials and can collect nearly 100 litres (over 25 gallons) of potable water in a day. Election time in Bhubaneswar, the capital of Orissa, India provides a welcome boost to income for large numbers of people. Thousands of bamboo poles are needed to string party flags and banners, as well as frames and stands for campaigning. 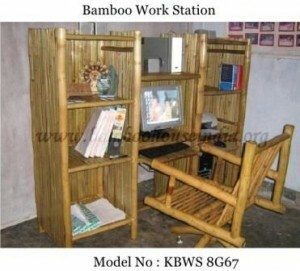 I wonder happens to all the bamboo after the election? 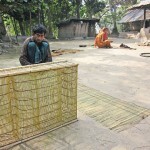 The Patwari family in the Narail district of Bangladesh make bamboo fish traps of a design so old that no-one remembers how it came about. 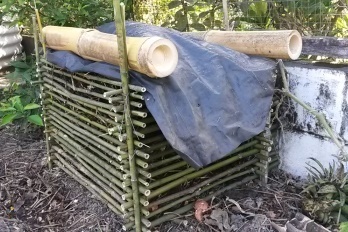 Bamboo is cut into the thin strips to make the traps. The family can make 2 or 3 fish traps a day. 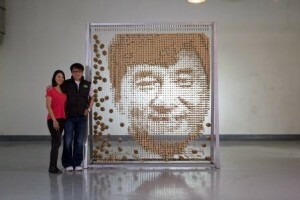 Malaysian artist ‘Red’ Hong Si created a portrait of Jackie Chan using 64,000 bamboo chopsticks. Read why on her blog. There is also a short video of her and Mr Chan himself in a chopstick duel. An Irish explorer and his Vietnamese crew member were reunited 21 years after crossing the Pacific Ocean on a bamboo raft. Great looking craft. The book about the voyage, The China Voyage: Across The Pacific By Bamboo Raft was published in 1996 and the Vietnamese translation was released this month. You can learn more about the vessel here. More lovely bamboo accessories for ifolk. No electricity required for this portable speaker. 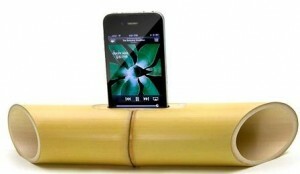 The natural acoustics of the bamboo amplifies the sound. iBamboo portable speakers are available on Amazon , but not if you’re in Australia. Sabang (Philippines), is probably most famous for it’s underground river. 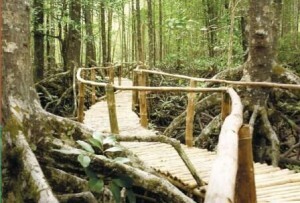 If you stay around longer than a day tour, you may see the bamboo walkway through the mangroves that leads to a bird watching area and trails to the mountainside forest. 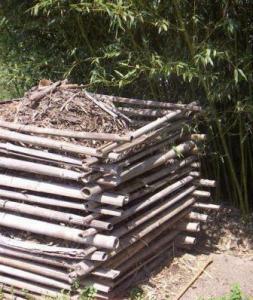 This entry was posted in All, Bamboo around the world, Bamboo craft and tools, Bamboo on the Internet, Food, Home and Health and tagged Amazon, art installation, bamboo, fish traps, Phillipines, Sims 3, water on 04/05/2014 by Deb.